In a family crowded with generations of teachers and writers and missionaries, Karen knew she would be a writer. when she was five, her father quit his job teaching at Smith College and the family moved to rural Connecticut. Karen’s mother made the long commute to Danbury State Teacher’s College; her father stayed home writing novels and caring for her younger brother. Karen entered first grade and began writing poems and stories. A few years later, her mother was teaching at the local elementary school and, when Kennedy was elected in 1960, her father, one of the few eligible local Democrats, was appointed postmaster of the tiny Marble Dale post office. In high school, Karen edited the school paper, read Lorca and D. H. Lawrence, studied French, and read her poems at gatherings organized by artist friends who lived in a barn. In 1967, Karen launched her college career at Reed College in Portland, Oregon, by getting arrested for chaining herself to the door of the local draft board. She began studying Russian and had a particular enthusiasm for the poems of Yevtushenko. It was an exciting time, but not particularly conducive to staying in school. Karen and her boy- friend, Garrick, dropped out and, with a group of friends, started the Rainbow commune near Drain, Oregon, where their daughter, Eden, was born in July 1971. After a few seasons on the land and a few more on the road, Karen and Garrick separated. Karen and Eden moved into Eugene, where Karen joined the 10 point 5 editorial collective, read Doris Lessing and Adrienne Rich, and took a job in the textbook department of the university bookstore. After auditing a couple of French classes, she returned to school to earn her undergraduate degree. The obvious next step was a year in France. In 1979, Karen and Eden were living in a tiny sixth-floor apartment in the 14th arrondissement in Paris. With a part-time position as an English language assistante, Karen had time to sit in cafés reading French poetry and dabbling in literary translation. She toyed with the idea of staying another year in France, but the scripted path won out over the less-certain one: she entered a doctoral program at Yale. Graduate school plunged her into literary theory, deconstruction, and feminism. Yet as she became more and more firmly entrenched at the scholar end of the scholar-poet spectrum, she found it increasingly hard to make any time and space for her writing. Writing poetry went underground for almost fifteen years and only bubbled up again when her twenty-year friendship with Elise evolved into a committed relationship and the couple moved back to the Pacific Northwest, where they had first met. In Eugene, Karen taught French literature at the University of Oregon and Elise trained to become a homebirth midwife. With Elise’s strong encouragement, Karen was able to forge a healthy balance between her scholarly work and her creative writing. She published scholarly articles and a critical monograph on Canadian women writers, her poetry appeared in journals like Potomac Review and Descant, and her chapbook of poems Sketching Elise was released by Finishing Line Press. She also rediscovered the particular pleasures of literary translation. Delft Blue & Objects of the World, her translation into English of two volumes of Quebec poet Louise Warren’s essays, was published in 2013. In Oregon, Karen found a welcoming community of fellow poets. 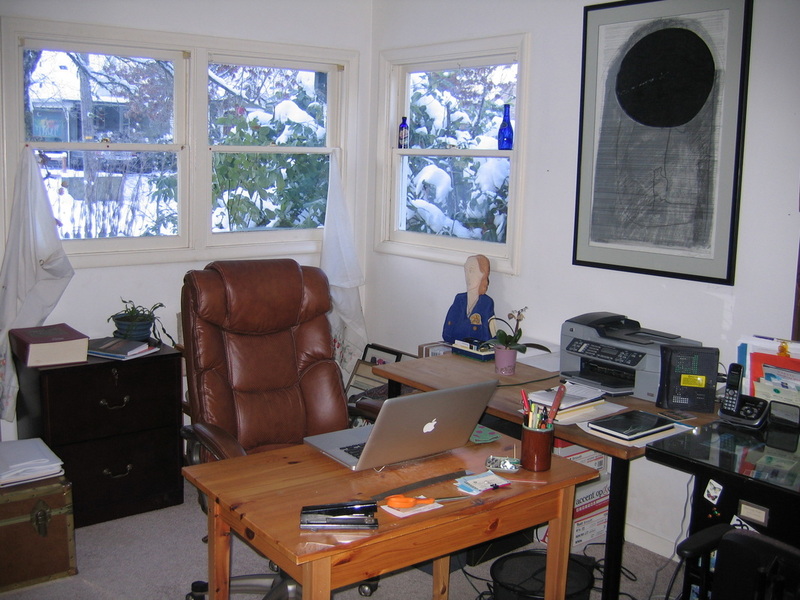 She made room in her schedule for artists’ residencies and writing retreats, including yearly reunions with her Porch Sisters, a group of writers she had met at Vermont Studio Center. A month-long residency at Playa in the Oregon high desert profoundly changed the landscape of her seeing and writing. On the occasion of her father’s eighty-fourth birthday, she edited and published Straightening Out the Record, a volume of his poetry. Karen continues to work as a professor of francophone literature at the University of Oregon. She is glad to have learned how to make the teacher and the writer play nicely together. She has no plans to become a missionary.